My meandering trip around the US via its fiction takes me to Vermont in winter thanks to a recommendation from Sarah Ward. In the very small (population less than 2000) town of Canaan in northern Vermont Frank Rath is an ex-cop turned private investigator. When the Police Chief is on leave Frank is asked by the town’s lone police detective for some assistance with an awkward missing persons case. Mandy Wilks is only 16 so the report from her mother that she has disappeared would normally generate a formal investigation but Mandy is emancipated which means she is, legally, an adult and her disappearance cannot be looked into until the requisite number of days have elapsed. Frank, with some assistance his police colleagues, soon discovers there is more than one missing girl from their area and they begin to piece together a rather alarming reason for these incidents. 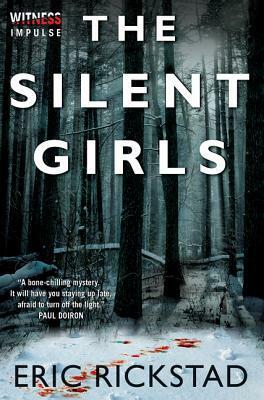 THE SILENT GIRLS starts brutally enough for me to be concerned this was going to be one of those books where violence masquerades as plot. Happily though the rather confronting opening makes way for a nuanced story that quickly engaged me and subsequent violence is relatively minimal. The story is complex – with multiple threads unfolding in parallel – but not fussily complicated. The procedural elements of the case are handled well, enabling the solution to be revealed credibly, and when the reasons for the disappearances start to become apparent the novel takes on an almost gothic sensibility which suits the content. In addition to the investigation there is a significant thread involving Frank’s personal life as we learn why he adopted and raised his niece as his own daughter and what present-day event will make him re-visit the horrific episode from his family’s past. Rath then goes on to scoff at the idea that his rural setting is somehow immune to the violence and harm that human beings can do to each other. Indeed. As a bonus that passage is also an indication of Rickard’s writing style which is above average for a crime novel that is at times pulp-y in tone. My only criticism of the novel is that the ending jarred and I wish the entire epilogue (which includes my least favourite trope of modern crime thrillers) didn’t exist but this is so common an occurrence these days I often forget to comment on it so I suppose I can’t be too harsh. Clearly my expectations for novel endings are completely out of step with almost everyone else’s and I just have to come to grips with this reality. Other than this THE SILENT GIRLS has well-drawn, multi-faceted characters, a compelling narrative and an enveloping (if not particularly inviting) physical environment. Definitely recommended. This is the fourth novel I’ve read for the Reading USA Fiction challenge wherein I will read 51 books (one set in each state and one for the District of Columbia) by new (to me) authors. Book Series #1 in the Frank Rath series? Or a Standalone? This entry was posted in book review, Eric Rickstad, USA and tagged Reading USA Fiction. Bookmark the permalink. Help. Can anyone please tell me where to read about the canaries in the beginning of the book? Bernadette – I’m really glad you mentioned that the book does become nuanced, with solid plot lines. I’m quite frankly put off by very violent beginning, and probably wouldn’t have gone on reading. At least I know if I read it, it gets better once the book is underway. And Sarah is a great source for recommendations. I like the combination of the gothic with the police procedural elements. And it’s good to know the violence is mainly in the beginning, and isn’t used for its own sake. Another one to add to the to-read pile. Based on your review (and Sarah’s, which I missed when it came out)… I am not sure this is for me. But I will keep the author in mind. The setting sounds good.